Born in 1920 in Southern China, Irene Vincent grew up speaking fluent Mandarin and Cantonese, in addition to English. After graduating from college in the U.S., Vincent and her husband John returned to China. There she raised two children, traveled, and started writing. 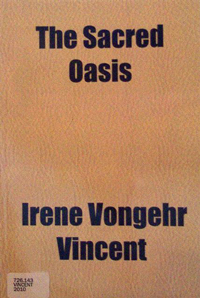 Vincent's Sacred Oasis: Caves of the Thousand Buddhas, Tun Huang (1953), is an account of her journey to the Tun Huang Caves in Northern China in 1948. The caves are among China's most important archaeological sites and contain murals and artifacts dating back to the 4th century. To get there Vincent had to travel by train, by truck, and on horseback and even spent some nights among caravan herders. Her book, with a preface by Pearl S. Buck, should be of interest to art historians and anyone wanting to know more about early 20th century Chinese history. Vincent later also published India: the many-storeyed house (1957). After settling on Bainbridge Island, Vincent passed away in 1997. Note: the book pictured on the right is in the KRL library collection. However, it is not the original rare book but rather a book printed "on demand" from a digital file produced by a robot scanning an original printed book and then running the scanned images through optical character recognition (OCR) software. Unfortunately when the book being scanned has faded print or is worn, the text produced by this method often contains numerous errors and are often harder to read. Vincent's book is also available on-line at http://www.archive.org/details/sacredoasis006071mbp.